Everyone has a bunch of old family photos sitting around in a shoebox somewhere just collecting dust. We can turn your pictures and slides into a DVD presentation complete with background music and titles. Give your photos and slides a new lease on life and let your whole family enjoy these priceless memories in a convenient digital form. Our fully authored DVDs play equally well on your set top player and in your computer's DVD drive. Each of your photos or slides dissolves seamlessly into the next at an interval of your choosing and the period musical background makes the viewing that much more enjoyable. Each print or slide is hand scanned into our server. We do not use high speed automated scanners that can damage or scratch your originals. Every original is corrected for density, color and surface defects as best as possible before the work is delivered to the DVD authoring station. In many cases your pictures will look better after the conversion to DVD than they will holding them in your hand. All work is done locally at our Wethersfield location. There is no shipping of your irreplaceable memories around the country. This is truly a labor of love and one we know your family will appreciate for years to come. In addition, you will receive a back up disc containing all the scans in their original high resolution format for your further use or just for safe keeping for the future. 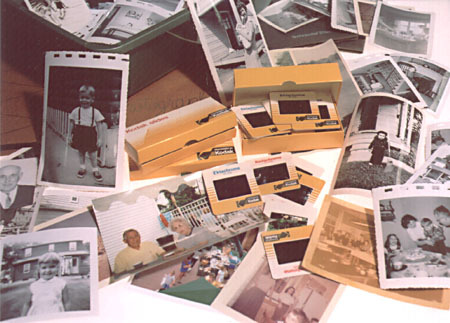 We can accept prints from 2" x 2" up to 8.5 x 14" and all 2" square slide formats (35mm, 126, 110). Prints should be clearly numbered on the back with a light pastel parker or Post-it Note. Slides can be supplied in their trays or in boxes clearly numbered in pen on the cardboard mount. Titles should be supplied on paper typed or printed indicating where in the sequence you would like them inserted.